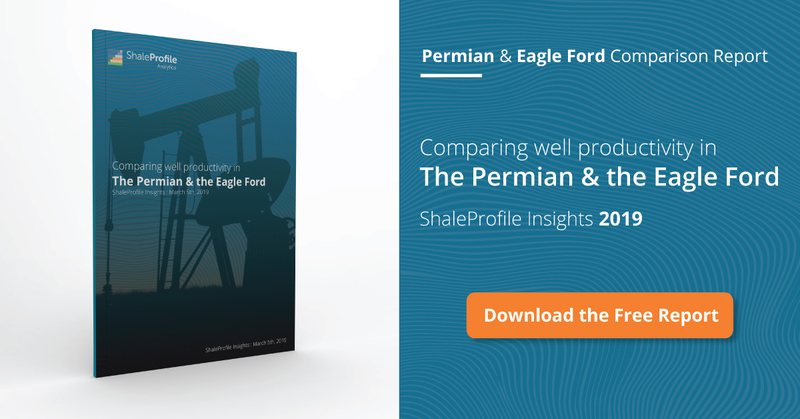 This interactive presentation contains the latest oil & gas production data from all 14,352 horizontal wells in the Permian (Texas & New Mexico) that started producing since 2009/2010, through December 2017. In this update, production from wells that are not yet fully processed by the Texas RRC (they only have ‘pending production’ records) is also shown. This has the effect that we can get a more clear picture on the developments in recent months, and it should also reduce (but not eliminate) revisions, which are typically high for this area. As you can see in the above graph, oil production from unconventional horizontal wells reached almost 2 million barrels per day in the Permian, with a doubling in output in just 2 years. The tooltips can show you that not many more wells were brought online in 2017 compared with e.g. 2014 (~3,005 vs 2,679), but as well productivity has significantly increased, the contribution from these newer wells is far larger. If you switch ‘Product’ to gas, you’ll see that the growth story for natural gas production has been very similar, and now more than 6 Bcf/d is produced from these wells. You’ll also note that the decline profile is less steep. In the “Well quality” tab, the production profiles for all these wells are shown. Wells that started in 2017 produced on average almost 100 thousand barrels of oil in the first 7 calendar months (shown in bottom graph). In comparison, the wells from 2014 reached this level only after 2 years on production. This “Ultimate recovery” overview shows the average production rate for these wells, while they are heading towards their ultimate recovery. Wells are grouped by the year in which they started production. To see more recent and granular data you can change this to quarter or month using the ‘Show wells by’ selection. In the 4th tab (‘Productivity ranking’), operators are ranked by the quality of their wells, as measured by the cumulative oil production in the first 24 calendar months since production start. If you change this measurement to 6 months, and only select the years 2016 & 2017 (using the ‘Years of first flow’ selection), you can see that from the operators with at least 100 wells, EOG had the best performance: the 190 wells it started to operate in the past 2 years, with at least 6 months of operation, did on average 137 thousand barrels of oil in the first 6 months. Later this week I will have a update on the Eagle Ford. Next week I will have a post on all 10 covered states in the US, and another one on a projection of the oil & gas output from all these horizontal wells several years into the future. As I mentioned in earlier posts on Texas, there are quite some data inconsistencies in the TRRC database in recent months. For example, there are several leases with production reported for new wells, even though these wells are not yet published as being part of these leases, or on the ‘oil proration schedule’. However, I made a fix this week that utilizes other data to establish this well-to-lease link. The result is that lease production can be better allocated, and therefore the strange issue that you may have seen in recent posts (e.g. for EOG in the EF where older wells had a bump in production), should be mostly addressed. Great data as always. Thank you for sharing. Is it possible to look at production (by year) normalized by lateral foot? Might paint an interesting picture in light of both longer lateral lengths and modified completion practices (e.g., smaller proppants…increased use of in-basin proppants currently) the past few years and forward. We are currently working on a subscription service which will make far more analytics & data available than shown here in the blog. This will also allow you to normalize based on lateral foot or proppant mass, and see other completion details, as these indeed haven’t stayed the same over the years (see also my upcoming answer to Brendan). I expect that we can show this in about 2-3 months!